* Manual style A/C Hose Crimper. 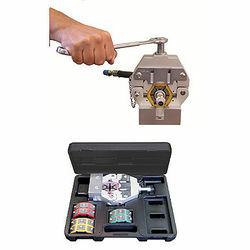 * Unit can be mounted on a bench using Holding fixture or held securely in a vice. * Kit comes with a complete set of dies covering standard hose sizes #6, #8, #10, #12. * Manual style A/C Hose Crimper. * Unit can be mounted on a bench using Holding fixture or held securely in a vice. * Kit comes with a complete set of dies covering standard hose sizes #6, #8, #10, #12. * A Quality product from Mastercool, USA.